Kenmare News | TY students have big hearts! TY students have big hearts! 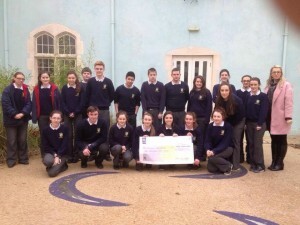 The Transition Year class of Pobalscoil Inbhear Scéine pictured presenting a cheque for €1000 to the ISPCC, funds raised in the school by hosting a Talent Show at Christmas and the money will pay for the training and supervising of two Childline volunteers. Well done to all.